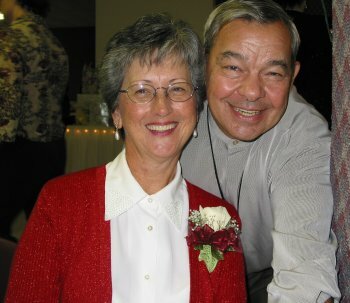 Bob Leroy Head (right, with his wife Joan) was chosen by Portland Beavers' fans as the Bob L. Head they'd most like to see honored on a bobble-head doll during a recent minor league baseball promotion. A name is everything to the minor league promotional team in Portland, Ore. For Bob Leroy Head of Maquoketa, Iowa, it’s his name that will allow his face to be immortalized in the Great Northwest. Head won the nationwide minor league baseball promotional contest held by the Portland Beavers designed to create a bobble-head doll in the likeness of someone named Bob L. Head. In February Portland announced a nationwide search for baseball fans named Bob L. Head. The Beavers planned to pick the most qualified fan, regardless of home town, and put their face on a bobble-head doll. The Beavers whittled six entries down to the top three and allowed minor league baseball fans everywhere to vote on the winner via their website. Bob Leroy Head’s 51 percent of the vote bested Bob Lee Head (34 percent) of Evansville, Ind. and Bob Louis Head (15 percent) of Vallejo, Calif. Nearly 30,000 people participated in the voting. All three finalists will be flown to Portland for a weekend’s worth of promotions. The actual Bob L. Head bobble-head giveaway is slated for Aug. 18 at PGE Park. The first 2,000 fans to pass through the gates for the Beavers’ Pacific Coast League game against the Las Vegas 51s will receive the doll. Bob Leroy Head will also throw out the ceremonial first pitch. The Beavers front office is already receiving requests from people around the nation wishing to purchase the doll. Portland is entertaining the idea of producing extra dolls, selling them, and donating the proceeds to a charity determined by Head, a chaplain. “National attention is kind of cool for minor league team, but our main concern is, how do we do things locally to get people to come out for a game?” Metz said.